In my view, calligraphy doesn’t always have to be two-dimensional. I really like pieces that aren’t hung on a wall, and making calligraphy books is a favourite. 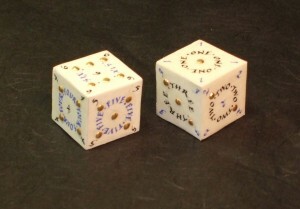 I had a different idea from a book, though, and that was to make some calligraphy dice, not just any old dice, but ones made with slunk vellum (very fine skin), with real gold leaf covered dots, and with the numbers written with a quill. First, I needed some wooden cubes which could be covered, and once I had these, the experiments started. The problem with using slunk vellum, though, is that it is by nature very thin, and so the darker wood could be seen easily beneath the skin – not a good look. I experimented with covering the wood with paper. The paper itself needed to be reasonably robust otherwise it too would show the wood through. However, none of the covering styles I experimented with were suitable as the skin still showed through what was beneath – the folds in the covering paper. In the end I simply used archival quality PVA and pasted this on one side of the wood. 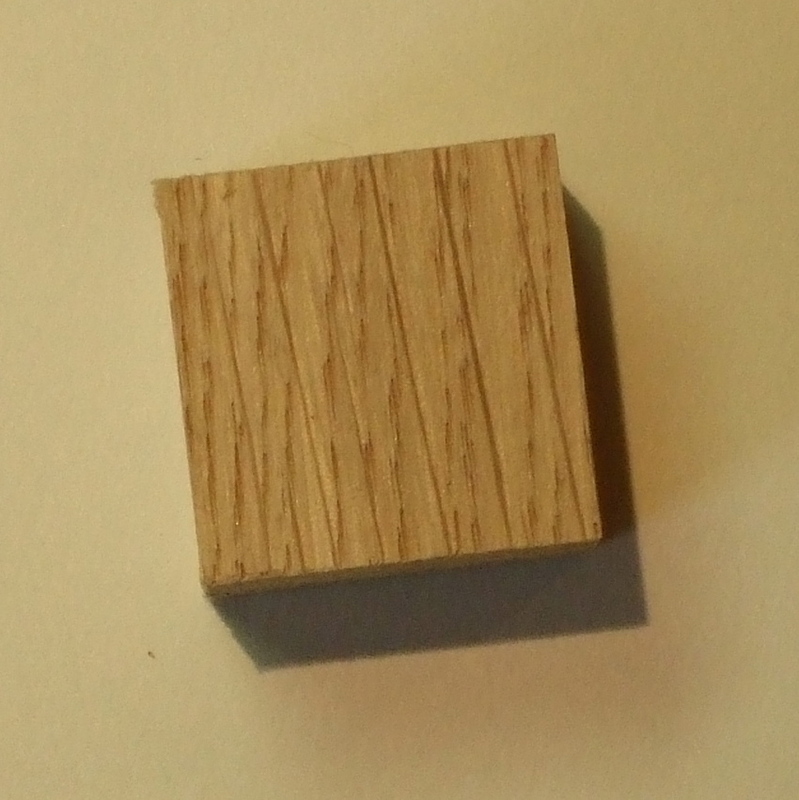 I then placed this on a square of paper slightly larger than one side of the wooden cube, and pressed and held down. 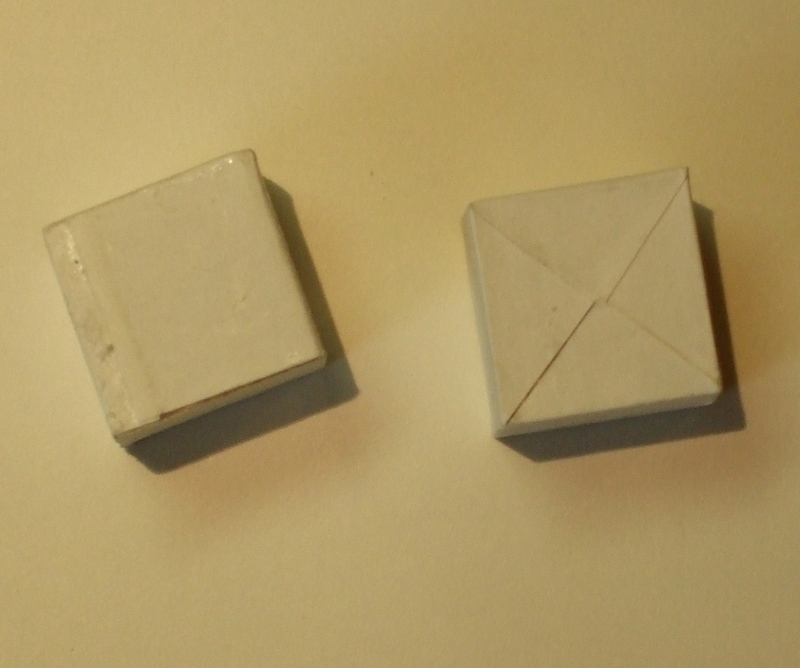 When dry, I used a knife to trim off the paper close to the edges of the cube, so there were no folds at all that could show through. Now to setting out the dice. 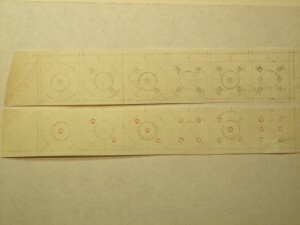 I experimented with various layouts, and needed to ensure that whatever style I chose, I could fit in numbers such as 6 and 1, which have three letters, as well as the number 3 with five letters (normally no problem, but I was working on an area of just over 2.5 cms (one inch), and the lettering was to be written as circles within that, so an even smaller space!). When I was happy with my design, I cut two strips of slunk vellum, treated it carefully (see my DVD for more details of treating skin for writing and gilding and lots more [download the order form]), and used a sharp 4h pencil, compasses, stencils for the circles and a straight edge to set out each face of the dice. 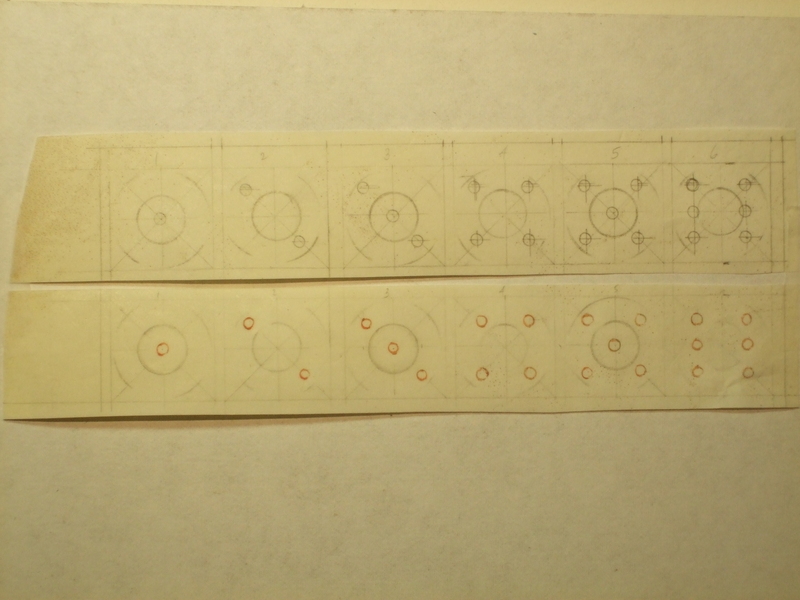 Rather than working with small squares of fiddly and curling up vellum, I kept them as a strip for ease. I made a new batch of gesso (my DVD again), and laid it with a quill, making sure that each dot was round and stood proud of the skin surface. I use a scientist’s crucible for both gesso and pigments and ink, rather than a usual flat paint palette, as the former has a smaller surface area for the moisture to evaporate. Traditionally (! ), we use the end of a paintbrush to stir the gesso, as the ingredients for gesso need to be constantly mixed. Using a quill to lay gesso usually means that there are fewer air bubbles, and this was the case in this instance. 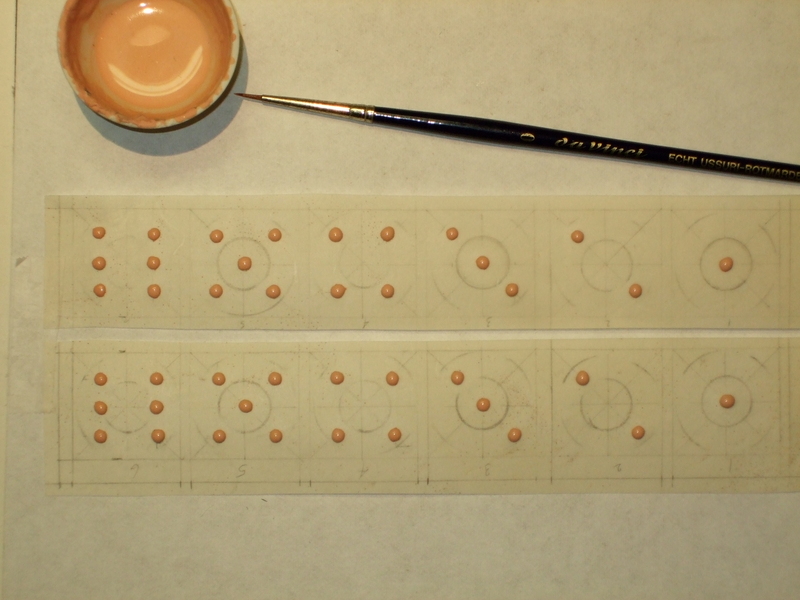 When the gesso was completely dry, I polished the dots with a burnisher (you might be able to see the shine on the dots of the top vellum strip). 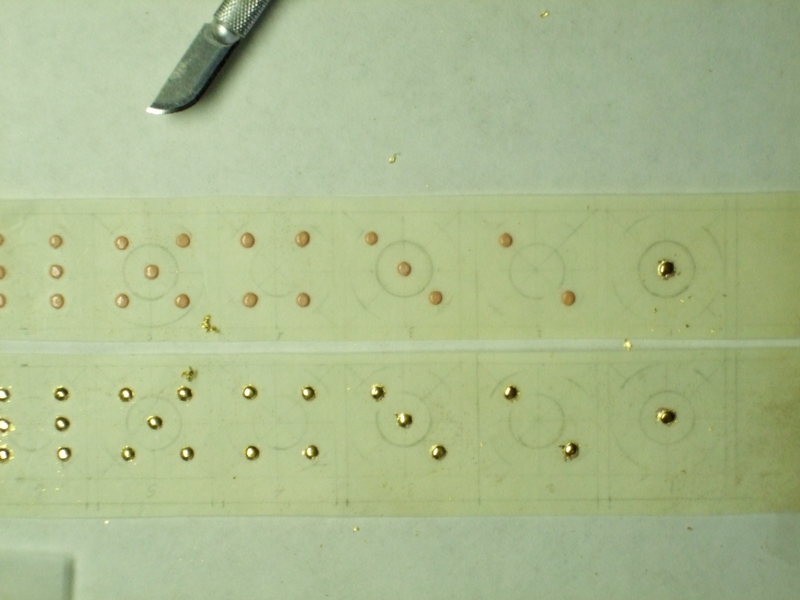 Then to lay the gold leaf – this was 23.5 ct, almost pure, gold leaf. I got up early one morning, because laying gesso needs a certain amount of humidity, and set to. 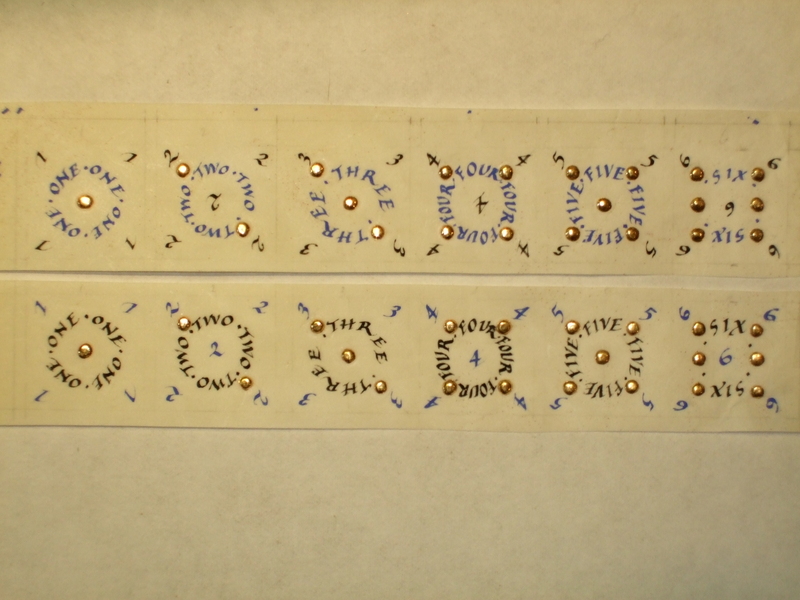 Gilding the dots was a little fiddly, but no more so than in some other jobs I had done. The curved-bladed knife is to scrape away excess gold when the gilding is complete. And on to the writing. I used a quill, recut so it was sharp (yup, that DVD again! ), and wrote the letters and numbers in Chinese liquid ink and in ultramarine Schmincke Calligraphy gouache (the best to use for calligraphy). I had planned for the two dice to look different, one with blue numbers and black lettering and the other with black numbers and blue lettering. When the writing had dried completely (always leave at least half a day for this on best pieces), I erased all the guidelines, and then carefully trimmed each square using a straight edge and metal rule. Finally, and really carefully, I pasted each side of the dice, and firmly placed the appropriate square of illuminated vellum securely. Usually I would use a bookbinder’s bone folder to press the surface down, but this wasn’t possible with the gilded dots. I allowed the finished dice to dry and here they are. And why ‘Luck be a Lady’? Well, those of you who are as firm musicals fans as me will know that this was sung in Guys and Dolls by Sky Masterson. The first line in his song ends with ‘tonight’, but I wanted luck to be a lady for more than just ‘tonight’! This entry was posted in Blog, Calligraphy and lettering, Interesting stuff and tagged calligraphy, calligraphy gouache, gilding, guidelines, illuminated dice, illumination, ink, layout, numerals, quills, vellum on 19 October 2013 by Patricia.